My Husband Todd would love to paint our entire home beige because he says that it goes with everything. He finds it soothing and he needs calm. I asked him about white, but white shows the dirt he says. I HATE beige. It depresses me. I LOVE color! What am I going to do? I gather that you’re planning on staying married to this curmudgeon prince? Fine. I think that we can find a way to keep him happy and give you more of what you want. How? I’m going to give you ten non-beige colors that act like neutral paint colors. What that means is that they go with pretty much every other color. That is—most colors that you’d want to use. But really, the easiest way to tell for certain is to take a color and if it exists abundantly in nature, you’re good to go. These colors don’t shout out madly like a toddler demanding attention, “LOOK AT ME OVER HERE!!! I’M A COLOR DAMN IT! STOP LOOKING AT THAT 18TH CENTURY OVERPRICED ANTIQUE. OVER HERE! ME!! !” No, they are confident to know that their place is to sit quietly on your five walls in the background harmonizing with all that is before and around them. 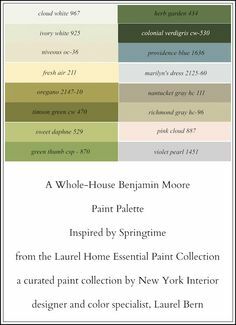 All colors via Benjamin Moore. And no, that’s not an affiliate link. I’m too chickenshit to ask them for money for helping to sell hundreds (maybe thousands!) of gallons of their lovely paint. I did ask a while back and was turned down with a “we don’t do that.” :/ Any ideas? The first color is the palest warm pretty pink. Pink is a wonderful neutral too! SEA FROTH 2107-60 is a wonderful color we did a couple years ago. I don’t have any good photos of it but here it is done in a nursery. And below too. It is vaguely mauve. MAUVE, you say? Yes, mauve. Oh poor mauve. It is such a crying shame what they did to it in the 80’s that makes us want to hurl just hearing the word. But please give it a chance. When done right with lots of browns and white and a touch of chartreuse perhaps, it’s a glorious color. Tempest is a deep gray-brown-purple. It’s a very relaxing color. 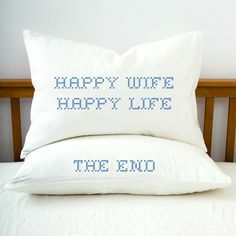 It’s perfect for a bedroom. Just trust me on that one. My number one pick for a soft yellowy-green is Benjamin Moore RAIN FOREST DEW. Depending on the light, this soft color can look more yellow or more green, but in either case, it is a wonderful colorful neutral that’s uplifting without being blinding. This is from a recent job and I really need to go over and take some proper photos. This was just a quick cell phone shot while we were hanging the window treatments. Dolphin’s Cove is the color of the walls in the Grace Home stores. I’ve never been in one but apparently, it is very popular. It makes for a fabulous backdrop. It’s turquoise but not on steroids, ya know? This interesting shade of bronzey browny green is Bunny Williams favorite color. That is her fabulous office. Copeley Gray is a deeper bronzey, not brown, not gray, not green, not taupe but all of them put together. A few years ago we did this in a bedroom belonging to a son who was now grown. I walked in and my jaw dropped open. Everything looks great against this color. The wood tones were rich and any color would go with this wonderful deep tone. It’s not really orange, but the perfect coral. Not peach. Not neon bright, but a coral that’s veering a tad towards red. It’s a soothing AND uplifting color. This is the richest, navy with just the right amount of warmth to it. I don’t generally like navies that are too cold, or that have red in them. Navy is a fabulous neutral. It loves every other color and these days is having a passionate love affair with pink. Would I do all of these colors in one home? Well… probably not. At least not all on one floor! I’m still working on a paint collection. It’s taking a while, because every single color is being scrutinized ruthlessly. There are only going to be 144 colors and I want everyone to be a winner. Otherwise, what’s the point? I love hearing from you guys! Do you have any favorite colors that go with everything? Colors that act like neutral paint colors? If so, please share! Wow….Sea Froth and Tempest both speak to me. I see either one in my living room but my question is….if you have a lighter neutral in your dining room across from the foyer, is that okay to do? 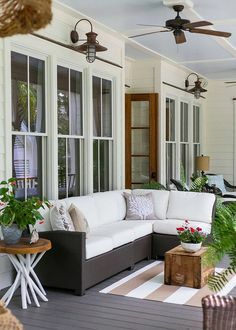 I am painting the chairrail and wainscoting in the living room the same cottonballs color as in the dining..so would that be enough to unite them? Hi:) I’ve just found your blog, and has been reading it, all sparkly-eyed, for the last two hours. So cool. Love your posts, informative and fun. 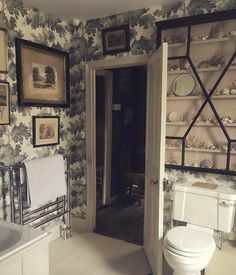 Except now I worry because I wanted to do our guest room brown, with blue and pink..and I am no Miles Redd)) I actually first saw these colors together in a room in Mary McDonald’s book “Interiors”(deep chocolate walls, bright pink and blue accents) and I thought “Wow. Why didn’t I ever think of it?”, and I’ve dreamed of it ever since. But I want to go with softened version-say, milk chocolate, not the 87 % one.. Here I love Tempest, and Copeley Gray, and Cleveland Green..
Love this post! Love seeing “return” of color. I painted a secondary bath and my foyer, SW Studio Mauve. I love it, but was feeling insecure about the choice–thanks for bolstering my confidence! No, Dana, dark colors make a room seem larger. Please see this post. I see Google is following your lead in using ‘mauve’ for it’s ‘neutral’ background today on its’ featured cartoon (see google.com). It’s so nice to find someone else who thinks brown and white look great together. I see so many people who say you need to go with cream or off-white with brown, and it makes me sad, because most of the time cream and off-white make brown look dull and lifeless. I love your blog! I always think, this is the type of blog post I would have written, if only I weren’t so lazy! Lucky for me, you do all the work, and I get the benefits. My faves tend to be on the warmer side. Living in the Midwest, we have changing, colorful landscapes, and IMO, earthy, natural colors tend to look best, inside and out. I confess though to being a pink fanatic, and would personally be very happy to live in a house flooded with a pink glow everywhere. However, my hubby and son would not be thrilled! Colors that act as neutrals are my favorite! When a green, blue, or coral, etc. is soft and muted, to me, they are beautiful backgrounds for other colors. The best though, as a color that is just as neutral as any gray or brown neutral, is a very soft, pale yellow with a bit of light tan in it. (I like to use my light, medium, and dark browns in woods, other natural materials, and metals rather than paint colors. )The light tan in the yellow mellows it, making it a quiet, yet still glorious yellow. Goes with just about everything! One example is ‘Ambience’ by Benjamin Moore. I have it in my LR, it is a light-filled room, so that may account for how wonderful it looks. In a medium dark hallway, I used ‘Downy’ by Behr and cut it 50/50 with ‘Polar Bear’ by Behr on one side of the hall, to lighten it up just a bit, necessary because the two walls are only 3 ft. apart and the color intensifies. The transition from the LR is just right. They appear to all be the same pale yellow, but are tweaked to be the right intensity for the different lighting conditions. I knew that name sounded familiar. Yes, “fireplace mantels that will make you plotz.” lol I’m so flattered by all of this! As for the paint collection, yes, I’m planning on charging for that. But it’s going to be more than just the paint colors. I would like to keep this one just with BM. With FIVE, yes FIVE fan decks, I think that there’s more than enough to work with. In fact, as I’m working on all of this, I’ll look at a color and go… “wait, that looks just like…” And sure enough, I’ll go to the other fan deck and the difference is so minute that most people would not be able to see it. It actually makes me a little bit angry because it feels like they’re just making life more difficult than it already is! Wow! Just fabulous! I love all of them and want to reprint every wall a different color in my tiny 700 sq. ft. Co do! Not really but make me want to make some changes! They are all lovely….especially the Copley Gray. I really enjoy your blog. I discovered it about 2 mos. ago and subscribed right away. This coincided with many interior and exterior painting decisions and projects which are ongoing. Your posts have been very interesting and terrifying, too. To poach a recent blog post title, for me, “Painting is Not for the Faint-hearted”. So, thanks, Laurel for sharing your wisdom. A lot of thought and testing -seven colors – went into choosing a SW exterior color. BM Cottonballs wall and trim coats a bedroom that had not been painted in 48 years! Yes, it was oil paint! This is just the beginning of all the painting that needs to be done. Thanks so much for this post, Laurel. I especially loved what you had to say about pink. I happen to love pink. I am not a design professional, but I know that people have a very emotional reaction to colors, and for some reason this color makes me feel wonderful. I love the bed in the Brown room. Can you tell me where I could find it?